Mandibeads: Swap Goodies: It's always worth the wait! 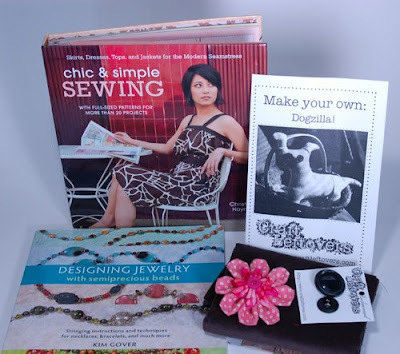 Chic and Simple Sewing- I have been wanting this book so bad! It's a great novice sewing book complete patterns of the cutest dresses, and even a rain coat. It will be hard to decide which one to make first. Designing Jewelry with Semi-precious Beads- I don't usually work with gemstones, but the book has several designs incorporating seed beads. I would love to make something using amethyst, my favorite color or peridot, my birthstone. Dogzilla, a Craft Leftovers project- I love green crafting and this project is too cute! I think I will end up adding some bead embroidery to him. He can be the watch dog for my bead stash. my very own pink kanzashi pin- I squealed with delight when I opened this and immedatly pinned it on my shirt! DH came to check on me, saw what I was doing, and called me a craft nerd, hehe. The design can probably be found in her book, Kanzashi in Bloom. I pre-ordered the book a month ago, and it should be arriving at the end of the month! 3 ancient (1949) issues of Gourmet magazine- I read one of the articles about a woman receiving her first freezer, and it made me fall out of my chair half laughing half appalled at the language of how it "used to be". There is fantastic collage potential between these covers! You can view the amazing things I sent here. Thanks Diane, you're the best!